Written in 1960, the novel won the Pulitzer Prize in 1961 and was made into a highly successful and critically acclaimed movie the following year. 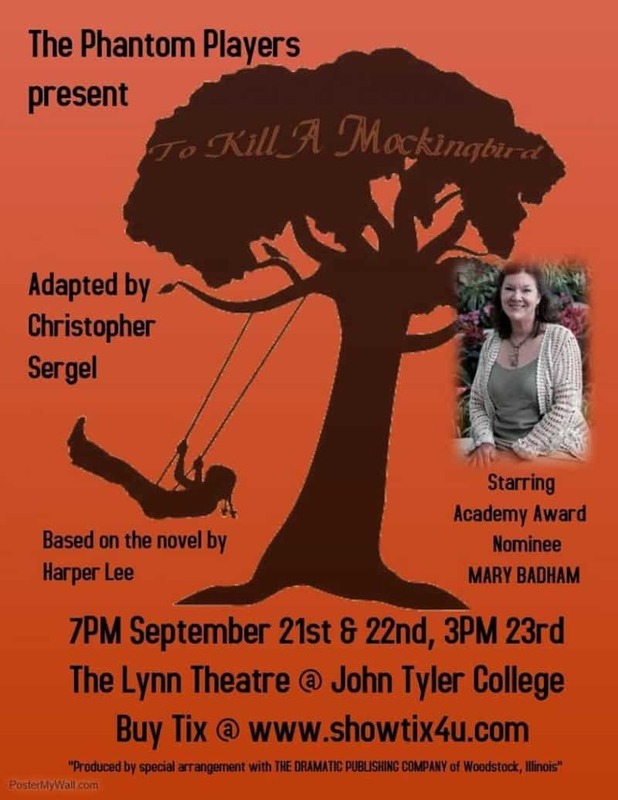 Selling over 40 million copies worldwide in 40 languages, To Kill A Mockingbird has never been out of print and is a staple of American high school literature curriculum. It is often cited as among the most influential novels of all time. The 1962 movie starred Gregory Peck, who won the Oscar for Best Actor, and introduced audiences to a young actress named Mary Badham, who was nominated for Best Supporting Actress; at the time, she was the youngest performer to be so honored. In a rare moment of life imitating art, Mary Badham will not be reprising her role as Scout, but evolving into Jean Louise Finch–the adult version of the same character she played as a child–who serves as the show’s narrator. This once-in-a-lifetime event will not be performed anywhere else and is likely to sell out quickly. Each of the three performances will feature a meet-and-greet reception with Mary Badham following the shows (for an additional fee). Tickets are available through www.showtix4u.com with discounts for groups and students. September 21 and 22 @ 7 p.m., and September 23 @ 3 p.m. Adult tickets are $18, Student tickets are $10 with school I.D. Group tickets are $10 each. If purchasing 10+ tickets, choose the Student option and then email info@thephantomplayers.com to reserve the group seats. Meet-and-greet reception plus photo-op with Mary Badham and other performers available for an additional $15.